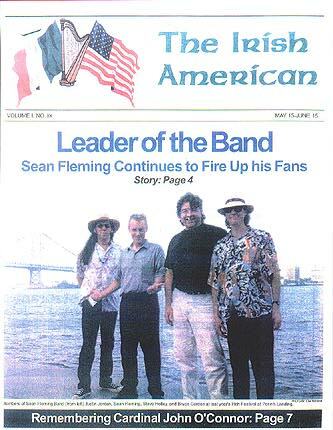 Read Free Lance Reporter Tom Purcell's Article about the Sean Fleming Band's performance after the World Trade Center and Pentagon attacks. The Sean Fleming Band knows exactly what we all need. You see, like every American, I was in a funk. I had been stumbling through my daily tasks. I was feeling down and tired. And I had good reason to feel this way. After all, several thousand innocent people were murdered for reasons I don't know that I'll ever comprehend. Similar and even larger attacks may be coming, the FBI warns us, maybe soon. We're big, fat easy targets, you see, and there are people around the world who hate us and who want to see us suffer. This unpleasant news is enough to bring anybody down, but there's plenty more to worry about. Our economy has come to standstill. Thousands are being laid off. The housing market has slowed to a crawl, and few people are out buying cars or other consumer goods that have been keeping our already weakened economy afloat. So I wonder: will I have an income a month or two months from now? That's why, like a lot of Americans, I've been in a funk. So I went out with a few friends the other night to escape myself. We went to an Irish pub for a pint of Guinness and to listen to some music. We were there about 30 minutes when I told my friends I wanted to leave. I felt guilty about being out while so much suffering was going on. I felt the need to leave that pub right away. Until the Sean Fleming Band stepped onto the stage. 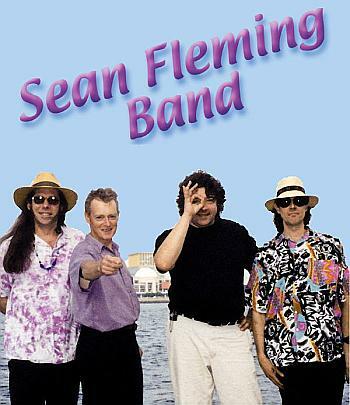 Sean Fleming is a musician who was born and raised in Ireland, but now lives in New York City. When he and his two band members began to play at the Washington, D.C. pub I was at, an electricity whipped through the room - an energy that connected us all together. Fleming's band played Irish, rock, country, sing along, you name it, with a vigor and intensity that unleashed the best within all of us. His band sang Johnny Cash, Bruce Springstein, Neil Diamond and other well-known American artists, and we sang right along with him. He played several old Irish tunes, and we sang those, too. And when he got to "America, the Beautiful" and "God Bless America," there wasn't a person in the place who wasn't standing and singing at the top of his or her lungs. Fleming's music gave voice to the fear, pain and anger that have been erupting within all of us. These emotions have brought out the worst in us, but Fleming cleared the rafters for everyone in that pub. As we sang together, we gave hope to one another. We stamped out our doubts, we kicked fear in the gut, we told terror and those who wish it upon us to go to Hell. We grew strong and we summoned from deep down the strength to do whatever it is that needs to be done to destroy the evil forces that have attacked us. We sang and hugged and shouted and laughed with an intensity I have never experienced at any music venue before. It was all because Sean Fleming gave us a way to comprehend, clarify and even overcome what was in every one us. "After the tragedy occurred," he said, "I didn't know what to do. It didn't seem right for me to go on performing while so much suffering was going on, but I soon realized that performing is exactly what I should do. We should all do whatever it is we do." In addition to being a brilliant performer, Fleming is also a brilliant thinker. He is right: the way to whip terrorism is for all of us to do what we do. Writers should write, preachers should preacher, chefs should cook and athletes should play. We need to move forward, as always, and continue investing, purchasing goods, and doing everything we've always done. Hope is the very foundation of our country and always will be. We cannot let fear of any kind slow us down. No, the way we will beat the evil that has attacked us is quite simple: we all need to get back to doing whatever it is we do. Just like the Sean Fleming band did. And another article from the Irish American! "However it was the Sean Fleming Band that topped off a perfect night"
While visiting the Washington DC area a few months ago I stumbled on one of the area's finest Irish Pubs aptly named "Ireland's Four Provinces," in honor of Ulster, Munster, Connacht, and Leinster. It was a Friday evening and as Irish luck would have it I got to experience the sounds and sights of the Sean Fleming Band. It was a wonderful evening filled with food, song and dance and a wee bit of Guinness which the Four Provinces is famous for. "Bartender John" Carr and his cohorts of American and Irish citizenship make it easy to belly up and stay a spell. In fact the Pub won the "Guinness Perfect Pint Awards" in1997 through 2002 and I personally voted them the perfect pint on that night too! But one doesn't want to forget the food and if you eat there you won't. Their food would make even your mother jealous. Their specials like the Whiskey Chicken Tullamore (skinless breast of chicken sautéed in a Tullamore Dew Irish Whiskey & leek cream sauce) as well as Traditional Irish Stew are mouth watering. I was also told that their Guinness Steak skewers a local favorite. Their dinner crowd starts filling in early enough to eat and then stay to make a night out of it. I found the bartenders and maids like Anne Murray friendly even as busy as they were. People were easy to talk to and I had many conversations and laughs through out the night. The atmosphere was comfortable and spacious while the decor was Celtic in every way. (In the back room hung a portrait of Michael Collins that I truly envied.) Their large outdoor patio was filled to capacity. These are just some of the reasons Ireland's Four Provinces was voted by Washington Magazine as "The Best Neighborhood Pub In Washington." I was introduced to Frank Hughes who showed me around and introduced me to Sean and the Band. Frank obviously enjoys running the Four Provinces and his wry sense of humor let me know that I wasn't a pampered guest for long. His easy going style turns one into a friend rather then guest and his sardonic comments only add to the cheerfulness of the place.
" and ended with a verse from various pop hits. It was hysterical. The variety of their music was impressive, from U2's "In the Name of Love," to Johnny Cash's "Ring of Fire", to Van Morrison's "Brown Eyed Girl," to Kenny Rogers' "The Gambler" to Bob Marley's "3 Little Birds." But the crowd really got rowdy (in a fun way) during their rendition of Garth Brooks' "I Got Friends In Lowly Places." So if you're in the DC area and want to have great food, fun, and entertainment look up Ireland's Four Provinces and let them know that Everything Irish sent you!